Way more than I had hoped for. Having come up with the idea on the fly, I didn’t really have many expectations. But was still surprised by the end results. A number of things aligned perfectly. Note: There are some minor spoilers — mostly overall narrative points and concepts. I try to keep out any character information, but you may want to tread carefully. It’s an oddly warm Monday and I’m just leaving the office. Walking to the subway I notice a long line forming outside Barnes and Noble. I’m curious. After poking around I find out it’s for ‘The Hunger Games’. They’re having a book signing with some actors from the film. Having just finished the first first book, I’m mildly interested, but I have no desire to stand in line for 30 hours just to meet some celebrities. In fact, I don’t like the idea of ‘celebrity’ at all. I think we should treat actors as normal people. I decide to skip it. Hollywood has its place, but often leaves a bad taste in my mouth. After all, parading these young actors around in front of screaming fans reminds me of the ‘Victory Tour’, something the characters in the book hate. That said, I’m still excited to see the movie as I really enjoyed the book — in particular the underlying questions it raises about workers rights and the excess of capitalism. I’m also excited by the fact that a new generation of teenagers is being introduced to concepts of labor abuse, overconsumption, and rebellion more directly than in any of the other recent popular series (Twilight, Harry potter, etc). My decision to ignore the Barnes and Noble event doesn’t last long. I find out #Occupy has just relocated to Union Square — 100ft from the book signing. I leave a note on the #OWS Facebook page mentioning The Hunger Games event, suggesting it might be worth reaching out to this audience since there are so many parallels with the movement and the books. I spend the rest of Tuesday chest-deep in the Rio+20 process at the United Nations. Sitting through endless meetings, I don’t have much time to think about #Occupy or the book signing, but the idea of taking action gnaws at me. On my way home I decide to swing by the square and see how the #Occupy folks are doing. Having been around since the very first night of the occupation, I like to keep tabs on things — at least, that’s what I tell myself. Secretly, I want to catch a glimpse of the actors and the massive crowd gathering for them. It’s always fascinating to see how people react in these sorts of situations. Once at union square I notice the occupiers are on the opposite side of the park, nowhere near the line for The Hunger Games which is now wrapped around the block. They seem to be ignoring each other. Oh well, getting them to interact was a bit of a long-shot anyway. It would take somebody familiar with the books to pick up on the #Occupy connection. To help unify the narratives. Then I realize: if anybody is going to do something, it has to be me. I’m already exhausted from a long day of meetings, but can’t resist my activist urges. The opportunity is too perfect and won’t come again. So it’s back to activist basics. I head down a side street and grab a discarded cardboard box from the trash. I hop over the Duane Reade and purchase a black sharpie. I quickly get to work. In the books, the country of Panem is divided into 12 districts who are at the mercy of The Capitol. Hunger, poverty, and unsafe working conditions are the backbone of the narrative. The sign is a bit of an inside joke for those who have read the books. I barely finish in time, heading over to the swelling crowd at 7:55pm. The actors are set to arrive at 8. The crowd is getting anxious, but I don’t tip my hand quite yet. I want them to see the sign, but know any action I take will be overwhelmed when the actors arrive. Time ticks away. The actors are late. The crowd is getting more and more excited by the minute. They squeal for random cars they think might have the stars. Finally, a black car rolls up and people go nuts. I quickly raise my sign as Jennifer Lawrence, playing the lead Katniss Everdeen, is ushered in. She doesn’t see the sign. I only see the back of her head. People scream with joy. When it starts to die down a bit, I direct my attention to the crowd. A few who notice my sign point at it, with some whoops and hollars. A second car pulls up and the crowd loses it again. It reminds me of the reaction the capitol citizens make when cheering for their favorite contestants in The Games. Especially Katniss and Peeta, exactly who these actors portray. I don’t even see the person ushered in this time with all the cameras in the air. I hear it’s Josh Hutcherson, playing Peeta Mellark. The crowd is charged with energy. I stay holding my sign. Influencing the crowd is the only thing that matters now. More and more people notice it and start taking pictures. It’s clear who has read the books because certain groups immediately get it. Some shout their support. 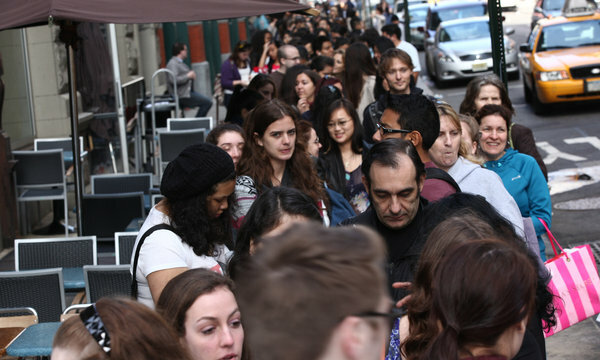 I decide to take a little stroll and walk down the long line waiting to get in which is still wrapped around the block. The reaction is immediate. With the actors having just arrived, adrenaline is running high, and I become the outlet for those further back who didn’t get to see the actors. As I walk, pockets of people spring up and start screaming, that high-pitched ‘oh my god I’m the happiest person alive’ type of scream. Groups of teenage girls go nuts for me. Others are straining to see what all the commotion is about — did another actor arrive? One of the girls in line takes the action to the next logical step and completes the call: she presses the three middle fingers of her left hand to her lips and then lifts them into the air. 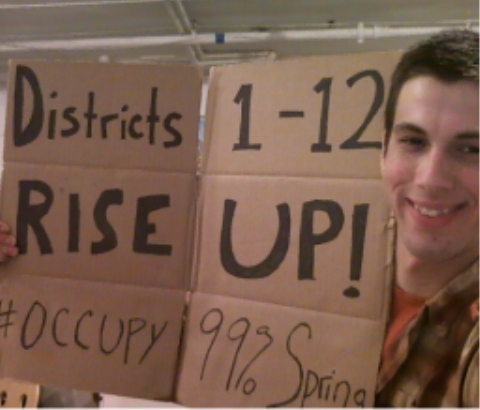 This is a sign in the books that becomes a symbol for the growing rebellion against The Capitol. I do it right back. With my three fingers raised, I loop back on the crowd. Immediately other hands spring up. I decide to keep at it. I join the masses in front of the store again, choosing a spot near the doors as people begin filtering out, having received their signatures. Some are in tears, others hyperventalating, but most just have huge smiles. I receive a steady stream of responses as people pass by giving thumbs up, asking for a picture, or putting three fingers in the air as a sign of support. Another cardboard sign suddenly pops up from within the crowd — one of the teenage girls is holding an ‘Occupy Huger Games’ sign. I give her a big smile and thumbs up. She puts it away shortly after, but looks excited. Not everybody gets it. I receive a couple confused looks, but do my best to explain what ‘Districts 1-12’ means. One heckler tells me to get a job — I let her know I work in the building on the corner, but I thank her for the concern. I also get a few oddballs looking for somebody to talk to, which comes with the territory of street activism. But these are exceptions. Mostly I just get excited responses from fans who love the book and find it easy to support the sign’s message. What makes it so accessible is that it’s something the characters they love would get behind. Something for those of us who are ‘true fans’ to rally around. It gives them something to participate in, almost as if they’re part of The Hunger Games story. Ah, the power of narrative and community. I hang around as the crowd thins a bit and start to wonder if I should head out myself. I still need dinner. But maybe, just maybe, I’ll be able to catch the actors when they come back out? The book signing seems to be just about finished. I’m hoping they don’t use a back entrance. I decide to stick it out, try my luck. See if the odds are in my favor. And if it doesn’t work I’ll get the last few fans. All of a sudden security is back and Jennifer is on her way to a car. She’s a quick walker and doesn’t seem to look at much of anybody. I doubt she sees the sign. The next car rolls up a few minutes later and Josh comes out. He’s also whisked away quickly into his car and I don’t think he sees me either. No big deal, still an amazing response to my impromptu action. And it isn’t even 10pm yet. As he’s sitting in the back seat of the black SUV, a grin spreads across his face. He loves it! He leans forward past the drivers seat and points directly at it, giving me an enthusiastic thumbs up. I nod, then put three fingers to my lips and lift them into the air. He does the same. He’s still smiling as they drive off. I like this guy. All in all, I couldn’t have hoped for more. I make my way back to the office with a huge smile myself and start writing things down, dreaming up ways to take this to the next level. I haven’t decieded on anything specific yet, but lets just say I’m now the proud owner of: occupyhungergames.com, occupyhungergames.net, and occupyhungergames.org. Matt, That is amazing. Great job. Thanks! It was a lot of fun :).